CP79 Universal Timer Relay 4 selectable time ranges with variable time ranges (potentiometer). Latch or pulse operation. Ideal for controlling lock open times to magnets, electric strikes, etc. Hi, guys. 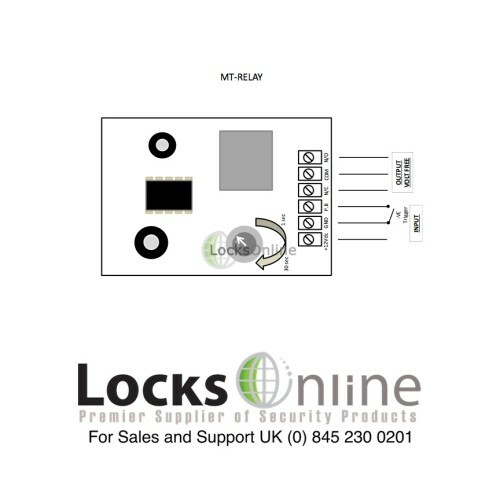 My name is Darrel and I'm of the head tech team here at LocksOnline.co.uk. Thanks for taking some time to tune in and have a look at one of our product review videos. Today we are looking at a timer relay. It is in our website. It's the CCL R1 Timer Relay. 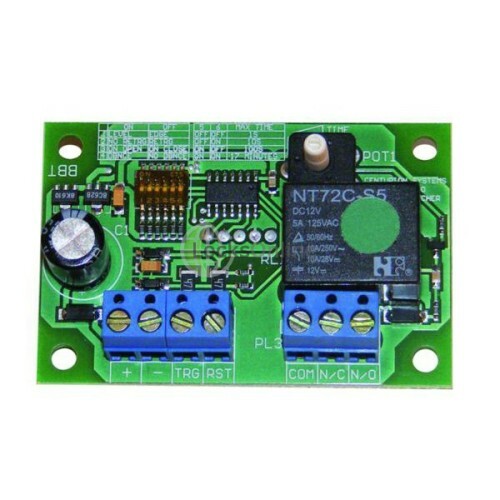 Now, the reason why you would want a timer relay and what are the principles and the functions of wanting a relay with a timer? Let's say from example you wanted to fit a magnet on the door. No problem at all with that and maybe you might turn around and say to yourself, "Well, I want to press the release button to actually release the magnet to get out." Yeah, no problem with that. You press and release button and the magnet will release. Well, what about you wanted to try and push the door to open or at the same time press on the button because unless you got so sort delaying or timing technique there, you could only open the door for the duration of you pushing the button. So if the button happens to be a meter or two away from the door and you press it, by the time you get to it, it is going to be locked again. What you would do is you would set a timer relay. When you press your button, it will then engage this timer relay to count down for predetermined time that is suitable for you before the lock would re-engage after. You may find if you got a door intercom system or something like that you might want to press the button and it may be that you want it to delay for one or two seconds or five or six seconds depending. Typically, it is around about five or six seconds that you would leave a door released to allow people to get in. That's the norm, the industry sort of standard. That is the whole idea as to why you would want a timer relay. 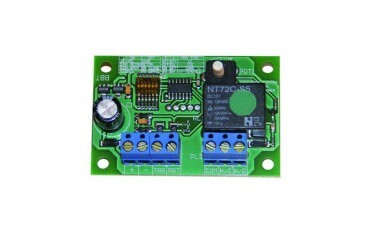 Now, this particular relay, the CCL R1, you put 12 volts AC or DC or 24 volts into here. No problem at all and it will permanently supplied into it at all times. Here are the top three indicators here. It's where you got your normally up and your normally set the close contacts. They're dry contacts. We call them dry. They're voltage free contacts. You decide what you want to put into it. The relay is capable of switching at 12 volts after five amps so it's got a lot pack there in regards to the relay. Of course, then down here then you've got your trigger. That's the actual trigger that will actually count the time down. Now, what you will also see just here as well is this potentiometer and that potentiometer allows you to vary the amount of time that the timer relay stays engaged for. And that believe it or not, is from one second all the way up to 17 minutes, so there is a significant amount of flexibility in regards to how long you want this to work for. Therefore it now lends itself for a whole host of different solutions and so forth. You could use it for switching lights on. When you trigger something, the lights could stay on and the lights could stay on for up to 17 minutes if you wanted to. It got a whole host of universal applications that are suitable for you. There you go, guys. There is not really much that I can actually say about the actual timer relay other than what its principles are, what its functions are, and whether or not you might want to use it in our industry as access solution. Of course, it has other solutions. We're not only limited to locking and access control, it can be used for a whole host of other things as well. It is quite a universal product in that respect. But if you need a little bit more information or you want a bit more of advice, feel free to pop a call over to us. You can speak to me or any of the guys in the team. We're all pretty knowledgeable on this product, or by all means use our live chat. It's totally free to use it in day time. By all means, pop and have a chat with me again or one of the guys or pop us over an email and in the evening we can talk and contact within the following day. Either way, we'd love to hear from you and more importantly, thank you and we would love to see you as a customers. So from me, Darrel, and all of us here at the LocksOnline team, this is CCL R1 Timer Relay and it is now available with us. Take care and I'll catch you real soon. Bye-bye now. Bye-bye.